We have not seen Awesome Color since their CD release concert in May at Glasslands. The most striking change in the band is the relaxed confidence that they have acquired after four months of touring around the world. Derek’s guitar work at the East Village Radio Fest was outstanding, and the rhythm section was tight and strong. The only drawback of this excellent set was its brevity — a festival-sized chunk of brilliance. Two new songs were featured, and the second one (Track 03) is one of the most powerful songs we have heard Awesome Color perform. This Music Festival was a celebration of the five year anniversary of East Village Radio, the most diverse and comprehensive radio station on the web. The Festival was perhaps the most organized event we have attended this year, and all aspects were outstanding — from the venue sound, to the availability of information, to the pinpoint scheduling. Kudos to EVR! We recorded from the front inside the soundboard area. The sound of this set is quite excellent, as the weather was clear and only slightly windy. Enjoy! 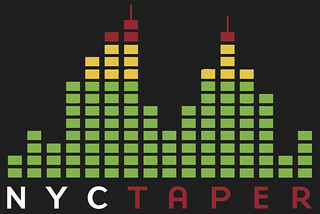 Vivian Girls, High Places and John Oliver were also recorded and will be featured on nyctaper in the coming days. If you email nyctaper for access to this recording, we expect that you will PLEASE SUPPORT Awesome Color, visit their website, visit their MySpace page, and purchase their latest CD release Electric Aborigines directly from the Ecstatic Peace website.